In my last blog post I explained about calligraphy pens, how they work and the different types. Today let’s have a look at the nib itself. Nibs are pointy little silver magic wands. A genius combination of design and gravity makes a pointed calligraphy nib one of my favourite inventions in the world. 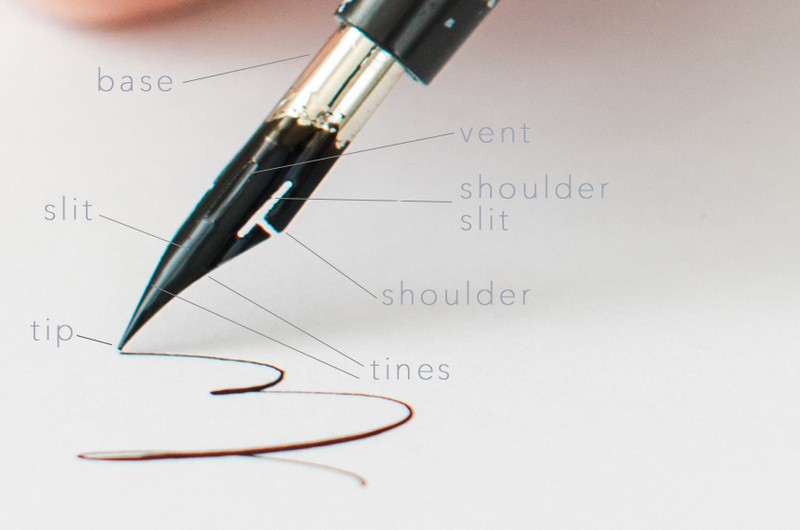 The curve of the nib is what holds the ink up. It’s a simple trick of gravity, surface tension and viscosity – you can even ‘scoop’ ink up with your nib as if it were a spoon! Modern calligraphy nibs are split down the centre, and the two halves of a nib are the ‘tines‘. Ink flows down the centre slit to make marks on the paper. 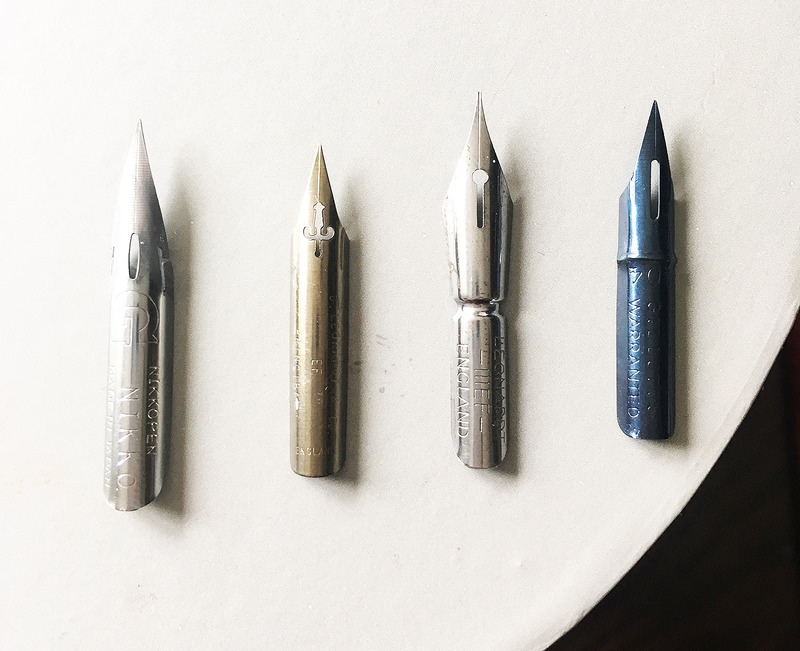 As pressure is applied to the tip of the nib, the tines split and it’s the distance between them which determines the width of your letterforms. 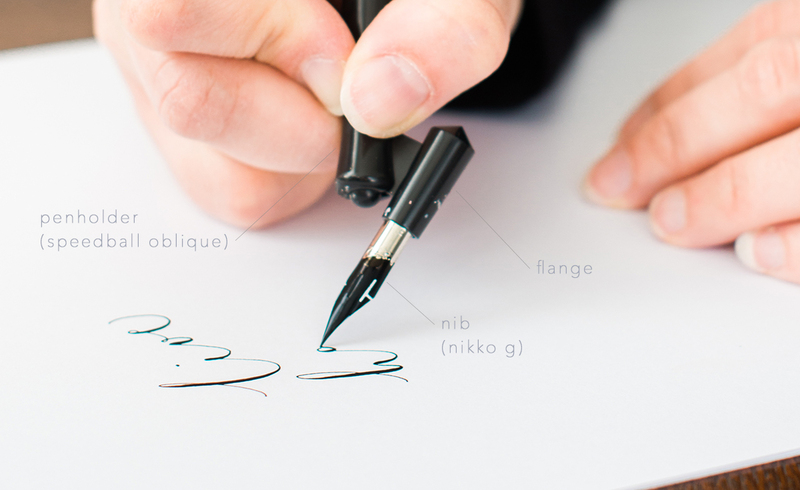 The shoulders of a nib affect flexibility. The broader the shoulders, the less flexible your nib will be. Some of my favourite nibs have shoulder slits – the Blue Pumpkin for example. Shoulder slits add flexibility by effectively narrowing the shoulders of the nib. The final part of a nib is the vent. 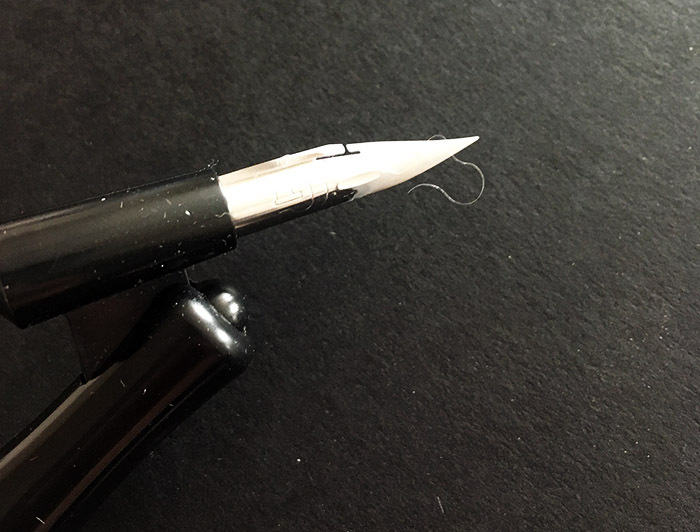 This is a tiny hole in the centre of the nib, designed for air and ink flow – but actually forming a magic little ‘window’ to indicate when ink is about to run out. Just before you need to re-dip your nib, the ink in the window will ‘pop’ like a bubble, leaving the window clear. 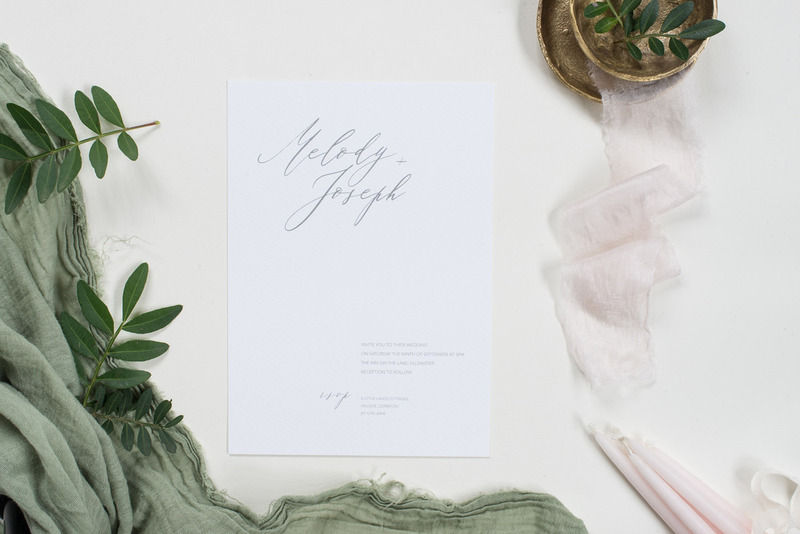 Are handmade papers suitable for modern calligraphy? 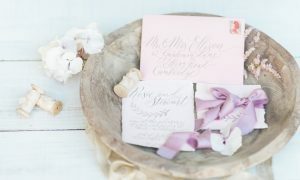 Way back in 2012 I first came across Cox & Cox‘s handmade place cards. 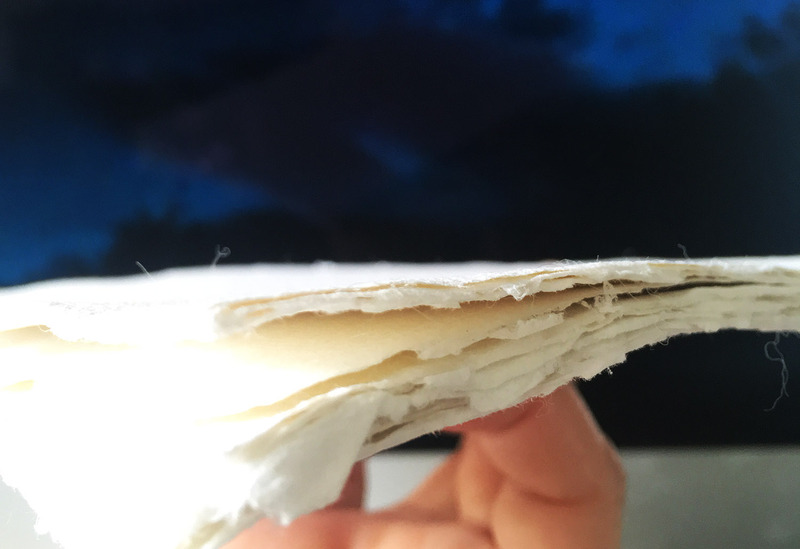 They were beautiful, handmade paper with soft, torn edges. 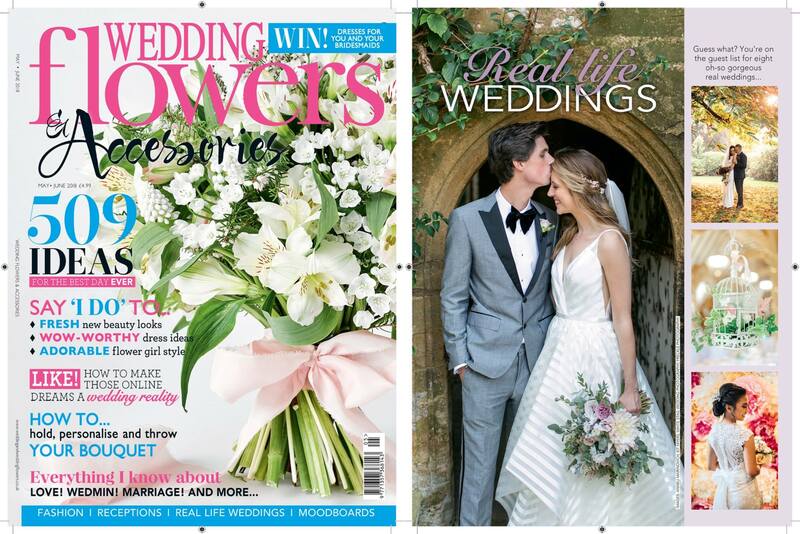 Cox & Cox advertised them as being ‘beautiful to write on’ – but the opposite was true! These were rough, fibrous and almost impossible to write on with a calligraphy nib and ink. But handmade papers are more popular now, more widely available and in a wider range of finishes. 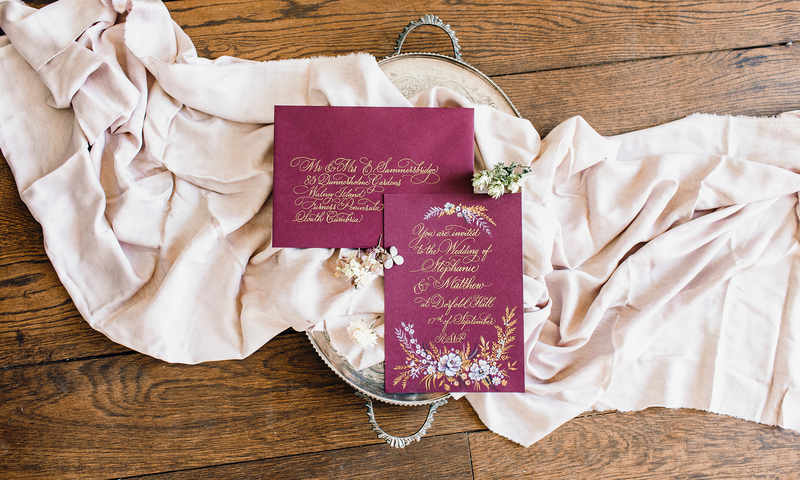 There are handmade paper makers who work primarily with calligraphers and wedding stylists too. 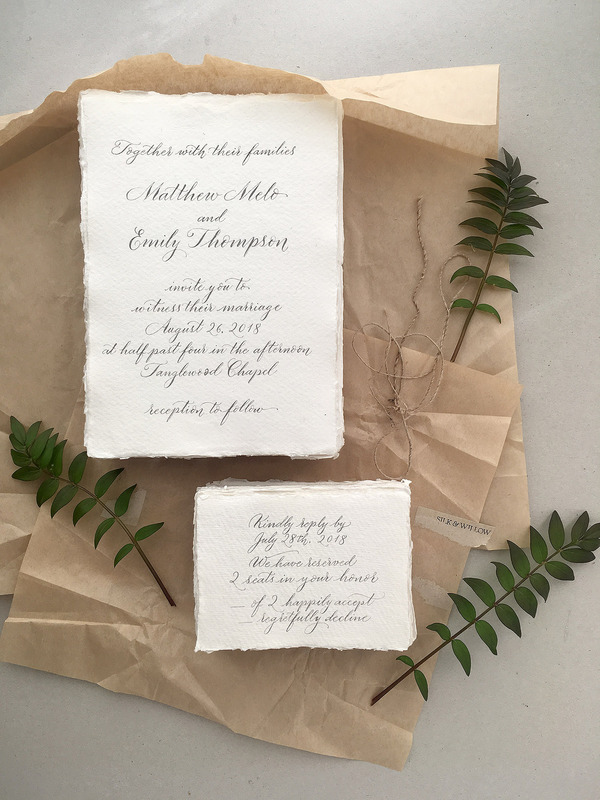 Silk & Willow were the first; lovely Kate Cullen has launched her own handmade papers for the UK wedding market this year. Are they suitable for calligraphy? The truth is, they’re incredibly hard to write on – but they are so beautiful it would be criminal not to try! This week I’ve been writing invitations on Silk & Willow papers. 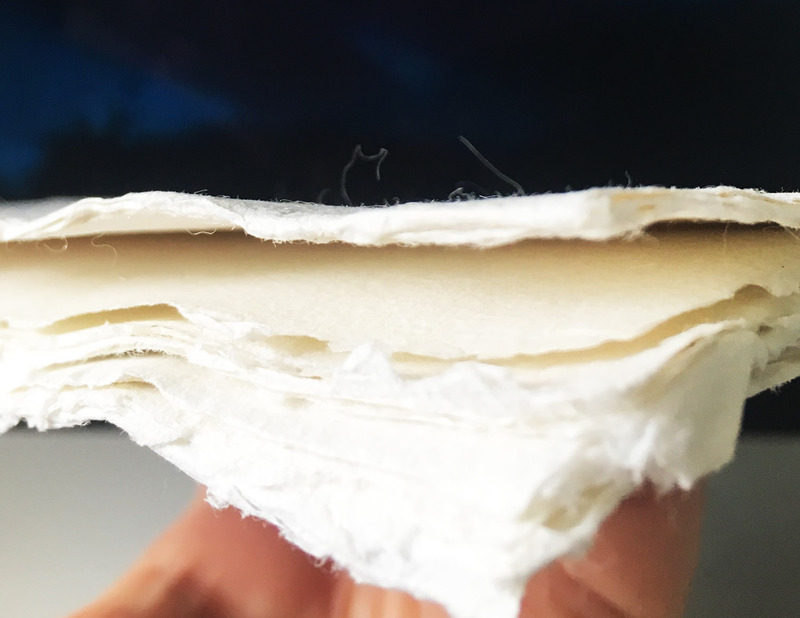 They’re fibrous – cotton rag papers have long fibres which bind the paper together. But they don’t always lay flat, and they catch between the tines of a calligraphy nib. This makes choosing a nib super hard! 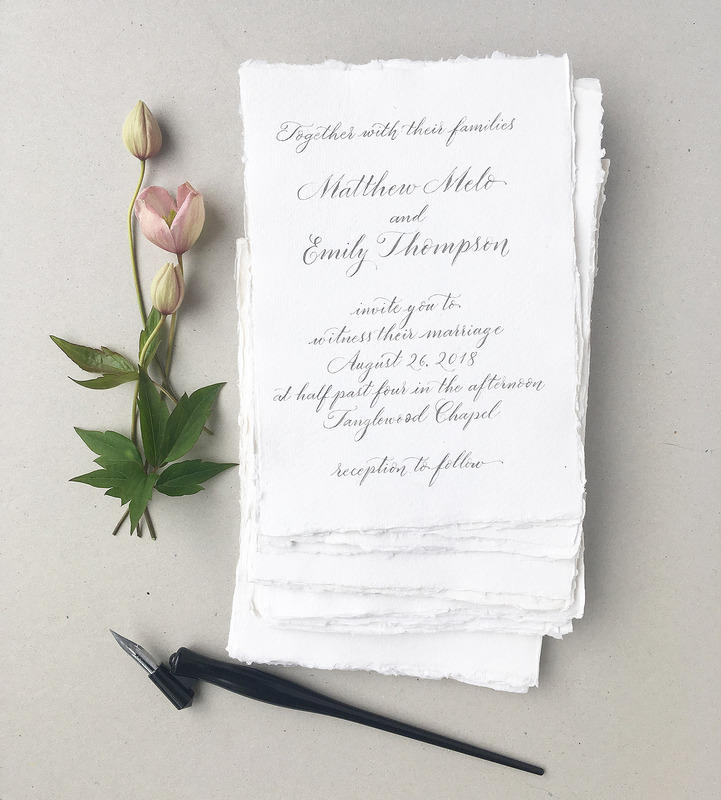 I’d had an email chat with Emily (the bride) where I’d mentioned I’d need to test the paper was ok for calligraphy – she sent me her Silk & Willow paper and I tested it with a Leonardt EF Principal nib – not too flexible, to allow fine hairlines which were essential for the small stationery and contemporary wedding invitation wording. The test was a success, but I did have to warn Emily that fibres would catch in the nib as I wrote, and they’d create some thicker lines and curves. We went ahead with Emily’s blessing. The Leonardt nib wore very quickly as expected. The key to writing on handmade papers is to go super slowly, especially around curves and corners where the nib is travelling sideways. 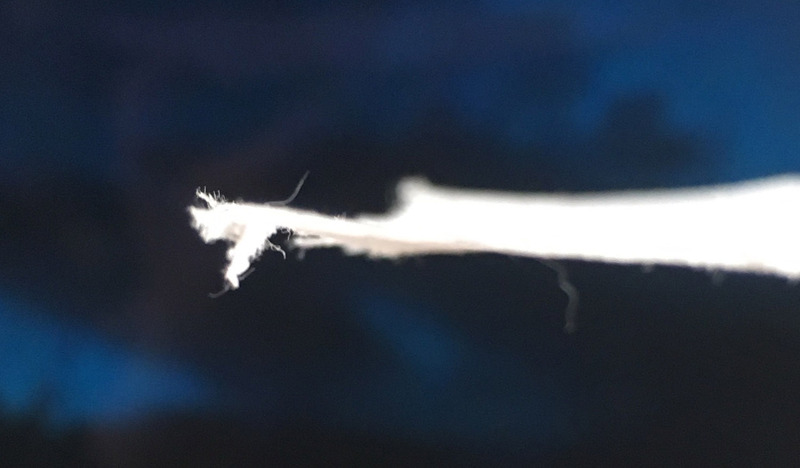 Loose fibres will catch in the nib – there’s no escaping it – so the trick is to watch every tiny movement of the pen and be ready to stop at the barest fraction of a second’s notice. A brand new nib causes fewer problems. As the nibs I was using wore, they picked up more fibres and slowed me down, so I tried alternatives to the Leonardt nib on a similar paper – and surprisingly, the Nikko G performed best of all. It’s not sharp, and it’s tight enough to make super thin hairlines on handmade papers. Win! I finished Emily and Matthew’s invitations happily with the Nikko G. They have a few little catches where the nib dragged those tiny fibres across, but overall the effect is beautiful. 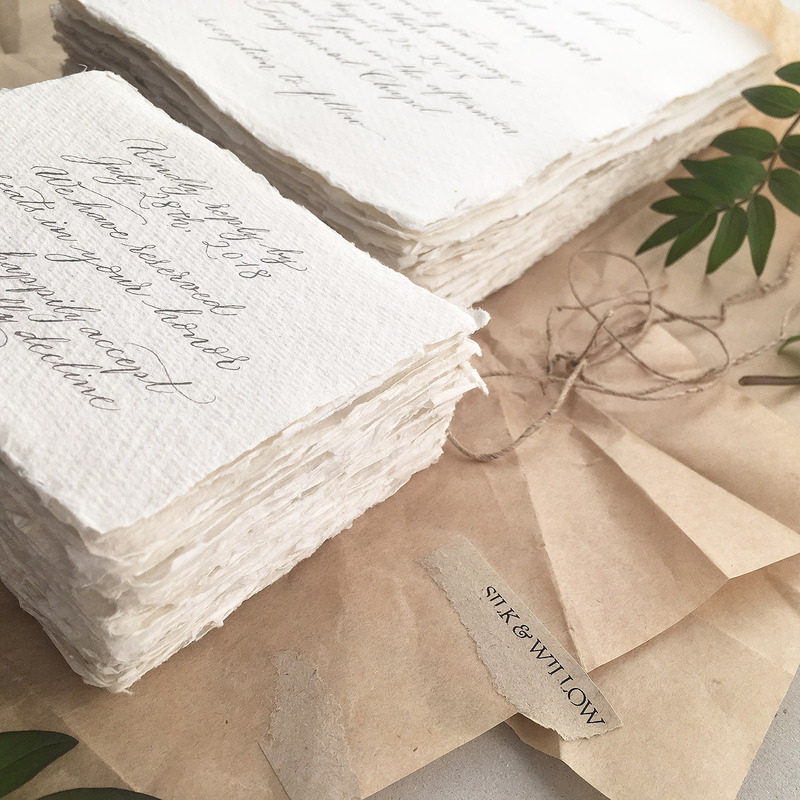 Hand calligraphy on handmade papers is a special kind of magic – it’s raw and real and I love it. 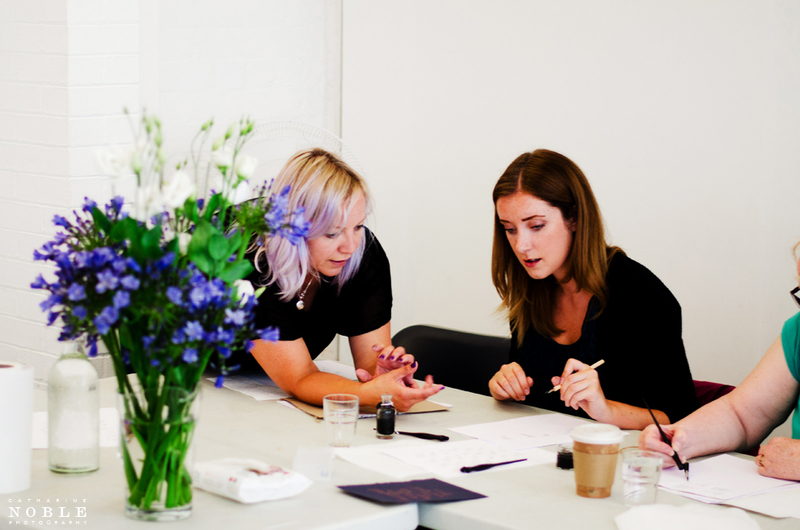 Behind the scenes – what a calligrapher actually does! This last week has been fairly light on calligraphy orders as I booked 3 days off for my birthday and to spend some time with my mum visiting my sister, her husband and our adorable little nephew. The in-between times were spent replying to email enquiries, writing family trees and posting calligraphy supplies to customers from my Etsy shop. 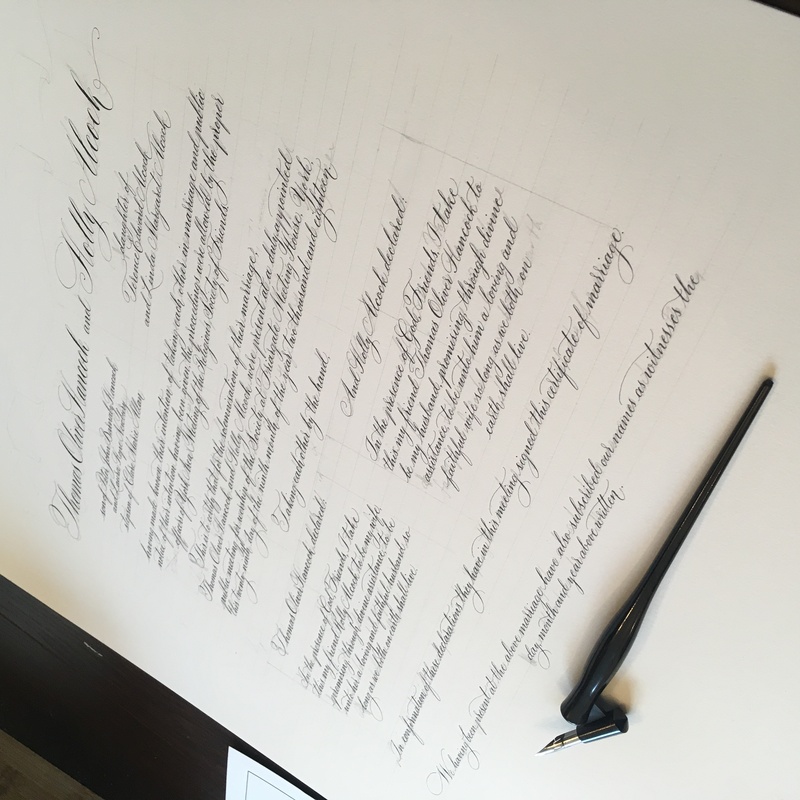 Not every calligraphy order is bespoke or handwritten – I enjoy mixing my own inks and began selling them in 2017. Wednesday was spent mixing shades of grey and metallic inks for new customers and preparing calligraphy kits for more lovely Etsy shoppers. 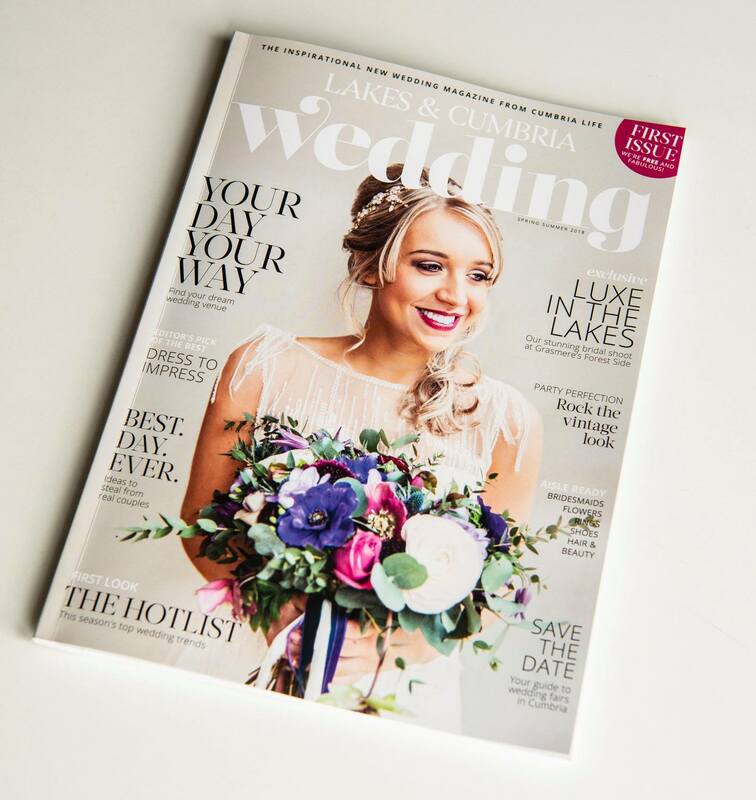 I was super happy to sell two sets of my modern wedding invitations on Not On The High Street this week – Adam ordered a bespoke version of ‘Modern Scribe‘ and Anna chose ‘Fashionista‘ – both lovely suites designed and launched back in January. 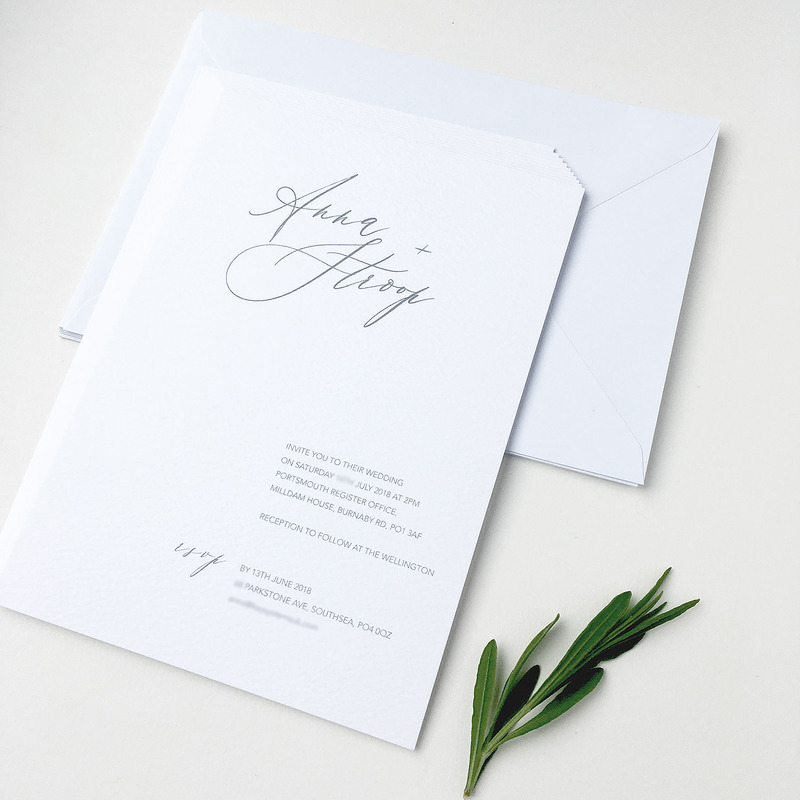 Invitations are really competitive – so many wedding stationers struggle to get their businesses off the ground so I’m thrilled to see sales picking up for our new collections. 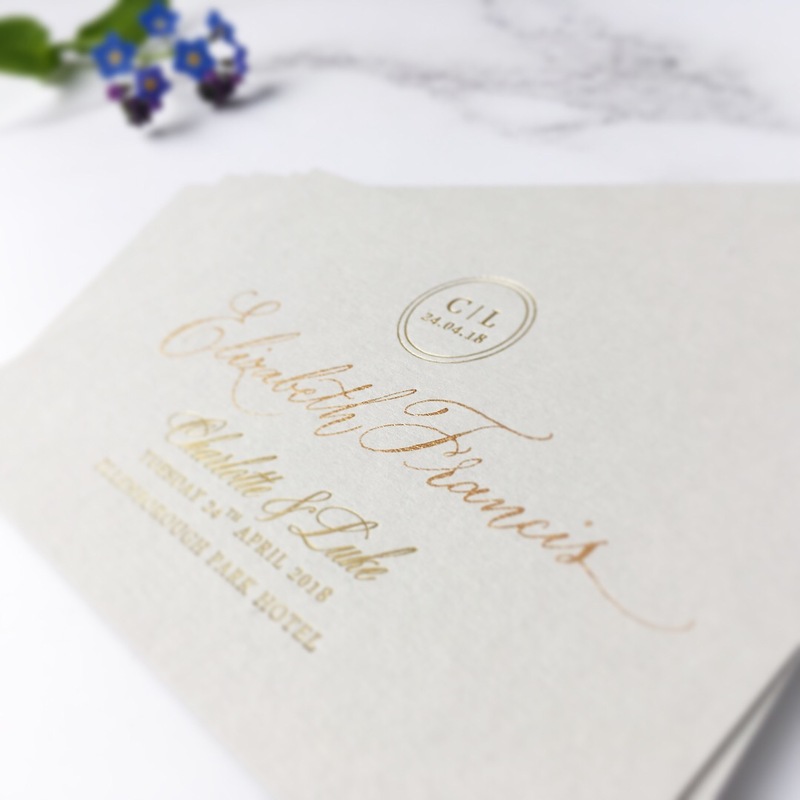 I’m looking forward to developing my lettering in the coming months – basic ‘modern calligraphy’ is slowly fading in popularity and brides and grooms are looking for unique and elegant lettering, so I plan to spend some time studying more elaborate lettering, flourishes and romantic calligraphy forms. Watch this space! 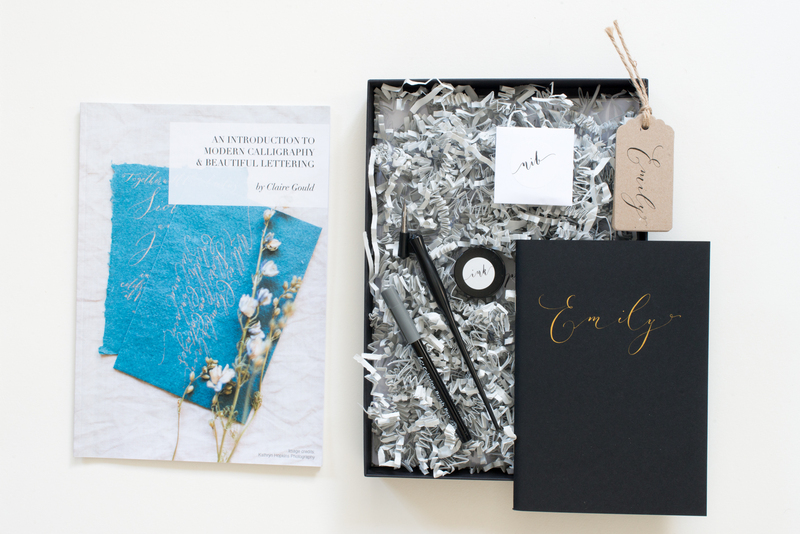 I keep hearing that we should all be blogging more… and to be honest, I take so many pics of every commission and calligraphy project which leaves my studio, I should be kicking myself for not blogging and sharing them with you! 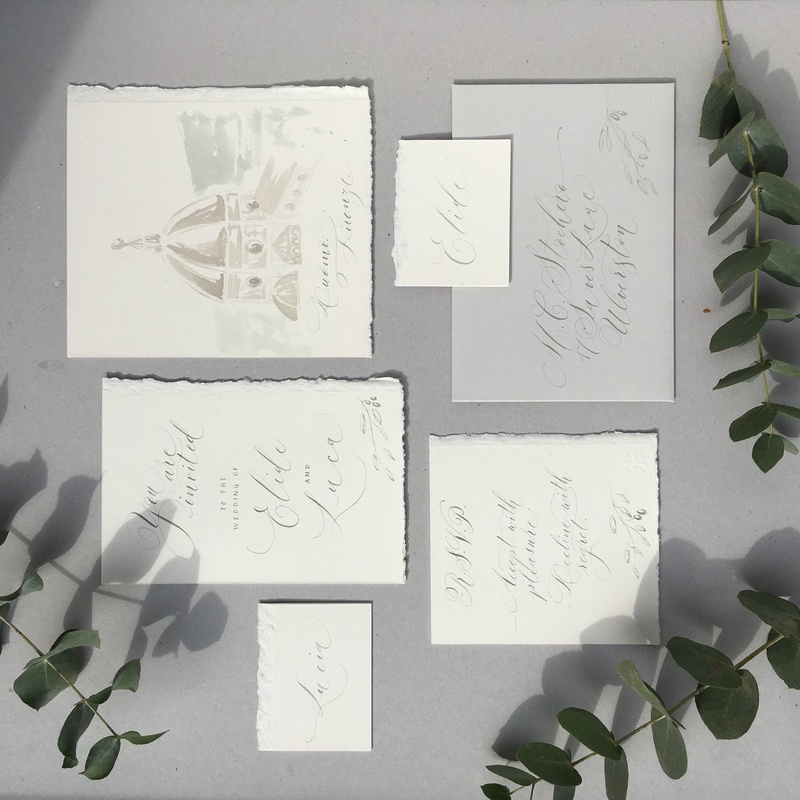 Whether you’re learning calligraphy or just curious about what a calligrapher gets up to on a daily basis, I hope my blog will inform and entertain you as I – hopefully – share all of my projects here as they leave the studio. April was busy with custom projects – a handful of family trees now with a new proof process before I despatch anything (it’s kind of lovely to get feedback before anything goes in the post). A bespoke Quaker wedding certificate with ivy and forget-me-nots which was a dream to write. 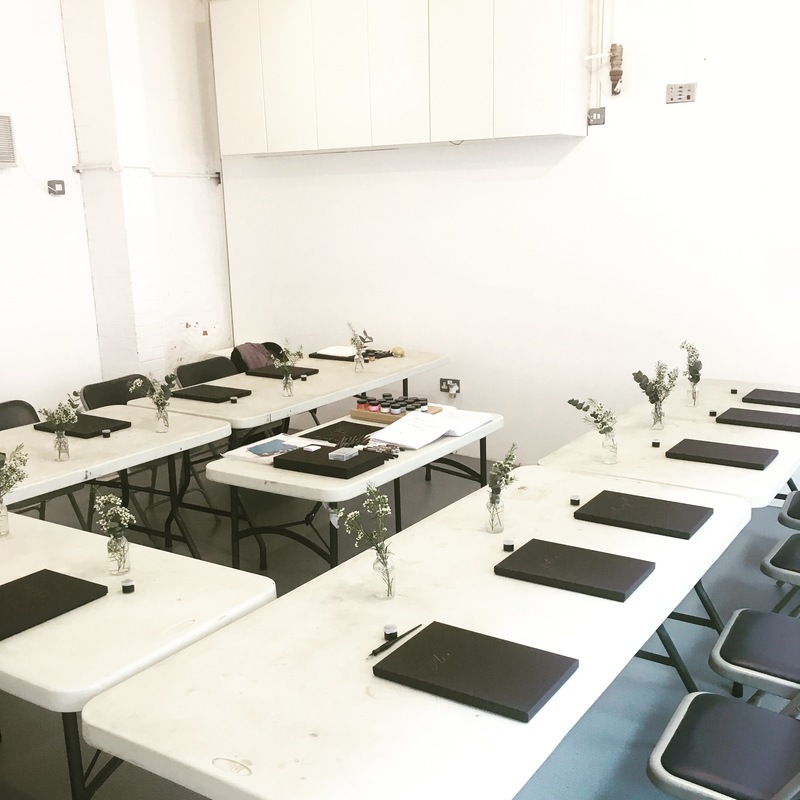 The classroom at Manchester Craft & Design Centre, all calligraphy-workshop-ready! 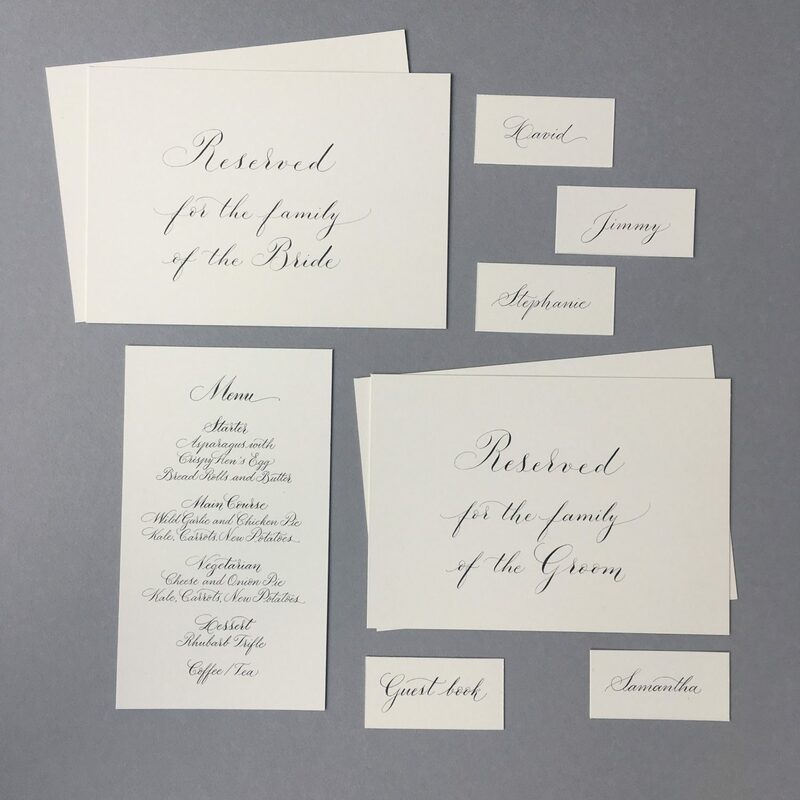 Two bespoke on the day stationery sets with place names, table plans, table names / numbers, and calligraphy signage – one couple chose a modern style with dusky pink lettering; the other opted for a more classic copperplate calligraphy, with black ink on watercolour paper. Place cards for the fabulous letterpress brand Strawberry Sorbet – these were a last minute order and a dream to write! We also had a few little breaks, first to Kielder Observatory (recommended for stargazers and geeky folks!) 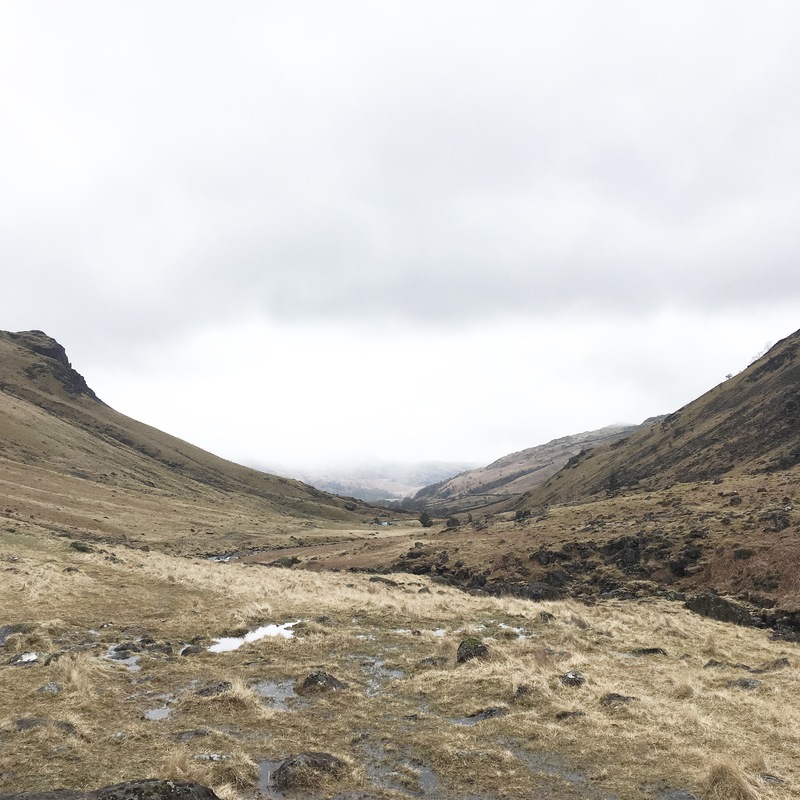 and then to Edinburgh and Manchester for concerts. And more press features, which is always wonderful. 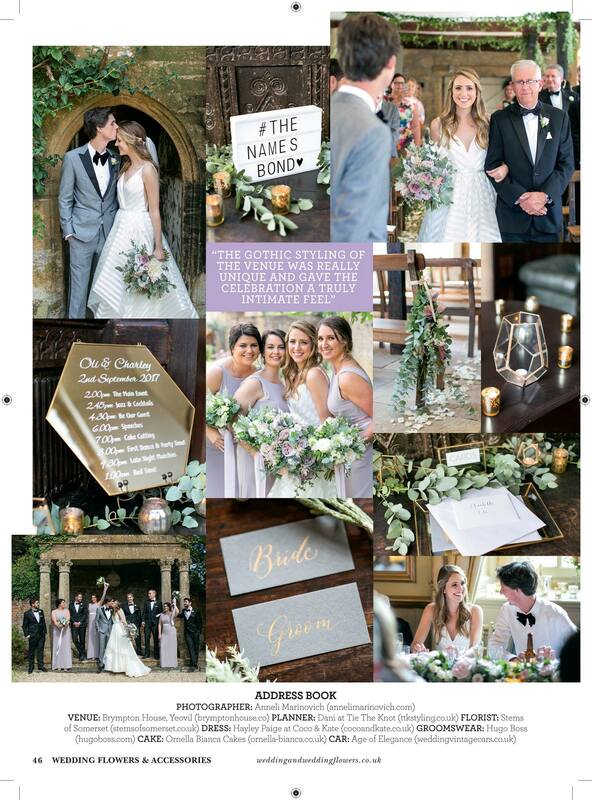 My calligraphy made brief appearances in Wedding Flowers and Accessories magazine (thanks to lovely Anneli Marinovich for sharing these images on her social media), the Wedding Community blog, Selvedge magazine, Love My Dress blog, Your Berks, Bucks & Oxon Wedding magazine, and the brand new Lakes and Cumbria Wedding magazine. 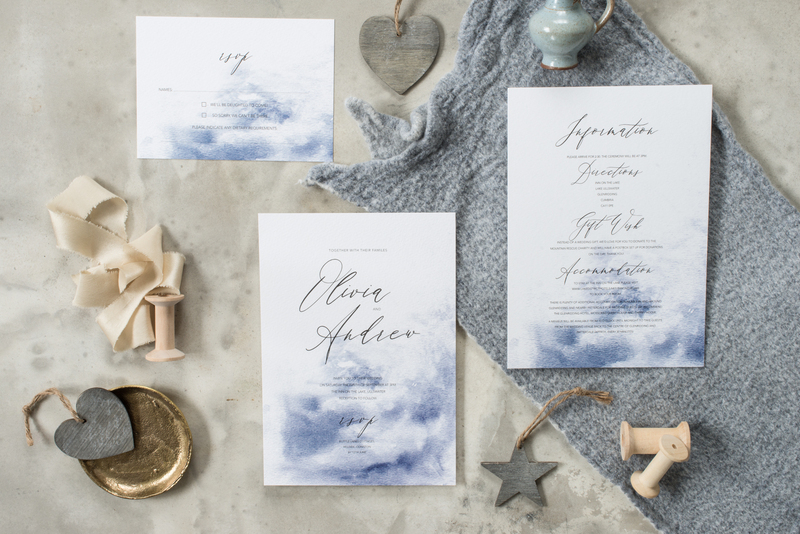 It’s my birthday month, so there are a few playing out days planned… but also a calligraphy workshop at the end of the month, wedding orders for tags and table plan cards, more invitations to be printed, and hopefully calligraphy kit sales after a little relaunch… watch this space!